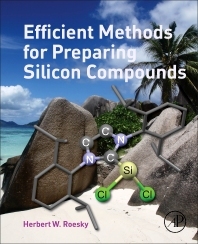 Efficient Methods for Preparing Silicon Compounds is a unique and valuable handbook for chemists and students involved in advanced studies of preparative chemistry in academia and industry. Organized by the various coordination numbers (from two to six) of the central silicon atom of the reported compounds, this book provides researchers with a handy and immediate reference for any compound or properties needed in the area. Edited by a renowned expert in the field, each chapter explores a different type of compound, thoroughly illustrated with useful schemes and supplemented by additional references. Knowledgeable contributors report on a broad range of compounds on which they have published and which are already used on a broad scale or have the potential to be used in the very near future to develop a new field of research or application in silicon chemistry. Inorganic chemistry researchers, those with some interest in relevant materials science and geochemistry. Herbert W. Roesky is an Emeritus Professor for Inorganic and Organometallic Chemistry with a broad experience in materials chemistry, homogeneous catalysis, fluorine, aluminum, and silicon chemistry as well as chemical education. In the tradition of great European chemical lecture demonstrations, he has given experimental lectures all over the world. His leadership in the above mentioned fluorine field is demonstrated with the international Henri Moissan Fluorine Award of France and the Fluorine Award of the American Chemical Society. For his scientific work of compounds with low valent aluminum, homogeneous catalysis, and new materials, he received from Germany the Alfred Stock Memorial Award and the Leibniz Award, from the Royal Society of Chemistry the Centenary Medal, from France the Grand Prix de la Fondation de la Maison de la Chimie and the Wittig-Grignard Lectureship, and from the American Chemical Society the Inorganic Award. The Indian Chemical Society of Research awarded him with the Rao Lectureship. These awards and recognitions in a number of countries demonstrate his independent scientific leadership of outstanding quality in research. After his retirement, he on started the chemistry of low valent silicon. The results have found international recognition due to their unique and unforeseen properties. The number of topics show his broad vision of modern and important developments especially in multidisciplinary research.